Approximate number of Virtus trained adults in the Archdiocese of Miami since 2002. It is approximate because many did not register online in the early years: 86,492 did register online and an estimated 35,000 did not. Children each year in the archdiocese who received either two Virtus Teaching Boundary Safety lessons or the Guidebook or both. Number of Virtus facilitators in the archdiocese who lead the adult Virtus sessions. Number of local coordinators in charge of compliance and record-keeping of the Safe Environment Policy at their parish, school or site in the archdiocese. 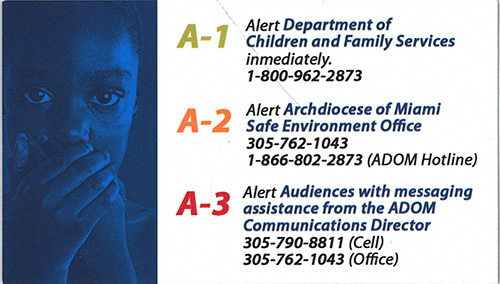 Back of business card-size AAA alert to remind pastors and other church personnel of the steps to take if they witness or are told of suspected abuse of children or vulnerable adults. Number of Virtus training sessions offered in the archdiocese when the program first started in 2003 and in the last calendar year, 2018. The highest total was 282 sessions offered in 2010. The average since 2003: around 197 per year. Rank of Archdiocese of Miami in number of adults who have been Virtus trained, out of 257 dioceses and organizations using the program. Number of priests, deacons, religious, seminarians and lay employees, plus volunteers and contractors, in the archdiocese who were fingerprinted in fiscal year 2017-2018 (July 1-June 30). Number of priests, deacons, religious, seminarians and lay employees, plus volunteers and contractors, in the archdiocese who were fingerprinted between July 1, 2010 and June 30, 2018. Earlier records show 30,950 people fingerprinted before December 2008. Current cost to the archdiocese of fingerprinting a volunteer; must be repeated every 5 years. Current cost to the archdiocese of fingerprinting an employee; must be repeated every 5 years. It's great to know these numbers and information. The information shows how much the Archdiocese of Miami takes this matter seriously and contributes to making sure our community gets prepared in this matter of high sensitivity. Buenas estadisticas! Gracias por la infomracion! Dios nos bendice, Gracias! The article was very informative and I was impressed on how the numbers skyrocketed. This is a great summary of the scope and level of commitment to this program. Keep up the good work. It is nice to see the ADOM strives and accomplishes so much to help protect our children and vulnerable. Again, these statistics are good to know about what is being done to protect children and vulnerable adults.